The Preparatory Course for Admission to Government Schools (Primary 5) is to strengthen international students’ foundations in grammar and vocabulary, particularly in writing grammatically correct sentences at the Primary 4 level. In addition, to help international students to achieve high arithmetical accuracy, complete assignment within allocated time, and understand the mathematical language, symbols and diagram at the Primary 4 level. It primary focus is given to the AEIS examination format as it is the main route for international students to enter the government schools. The course is to expand students’ knowledge of the various genres they may encounter in the comprehension and writing sections of the entrance examinations. In addition, they are taught how to tackle ‘multiple-choice’ questions format that dominates the AEIS examination. International students who missed or failed the AEIS examination are able to sit for the Supplementary Admission Exercise for International Students (S-AEIS) Examination in February of each year. The S-AEIS Examination will be for admission to the Primary 2 to Primary 4 and Secondary 1 to Secondary 2 levels only. There will be no admission to the Primary 5 and Secondary 3 levels under the S-AEIS. English Language Requirement: Obtained English Language proficiency of at least IELTS 1.0 or equivalent. Academic Requirement: Completed at least Primary 4 (Four) education or its equivalent. Classroom teaching, pair work, group work, discussion, projects and tests. English Teaching Module: Students are graded the skills of: Reading, Writing of the Mock AEIS Examination Papers. Mathematics Teaching Module: Students are graded upon the skills to apply mathematical concepts of daily assessment, worksheets and tests of the Mock AEIS Examination Papers. Certificate of Attendance will be awarded upon successful completion of the course. Currently, there is no new intake. 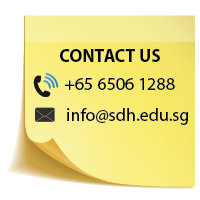 Please contact SDH Institute for further information. The module is to prepare students to sit for the AEIS examination conducted by MOE, Singapore at primary 4 level. Get Your Certificate Programme in Preparatory courses for admission to government Schools! (Primary 5)!